We work tirelessly through the year to produce unique ciders that you can enjoy with a meal together with your friends and family. Whether its cheese, pork, spicy sauces, or simple stir fries you will always find interesting new combinations. 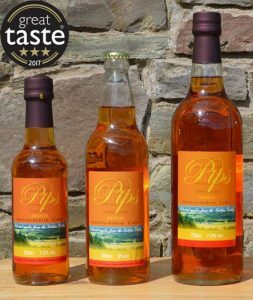 Pips Cider is a multi-award winning family owned craft cider producer based in the stunning Golden Valley, in Herefordshire, England. 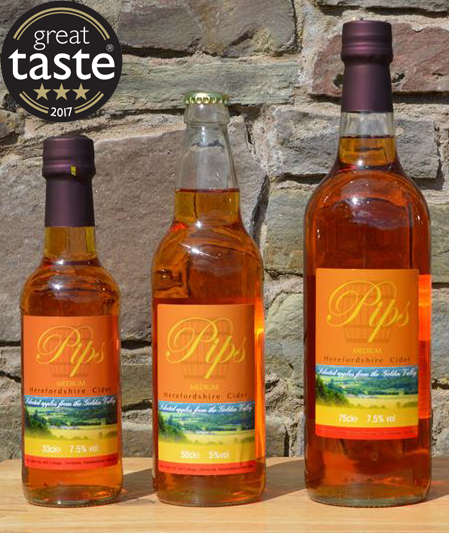 Their PGI accredited Herefordshire Cider is made from juice carefully extracted from seven different varieties of cider apples grown in their own orchard. The apple juice, and a special blending process encourages the different characteristics of each apple to complement each other. Pips is extremely proud of the awards they have won during their short history, none more so than in 2017 when they won the prestigious 3 star great taste award from the Guild of Fine Food. 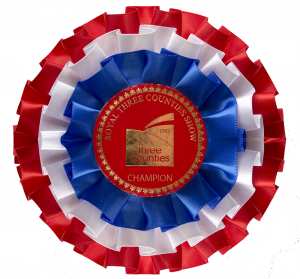 This is the acknowledged benchmark for fine food and drink, and has been described as the ‘Oscars’ of the food world. We love to meet old and new customers at various festivals, events, markets, and tastings throughout the year. Please like our Facebook or follow us on Twitter and tell us how you enjoy our ciders, and we can also tell what we get up to each week.